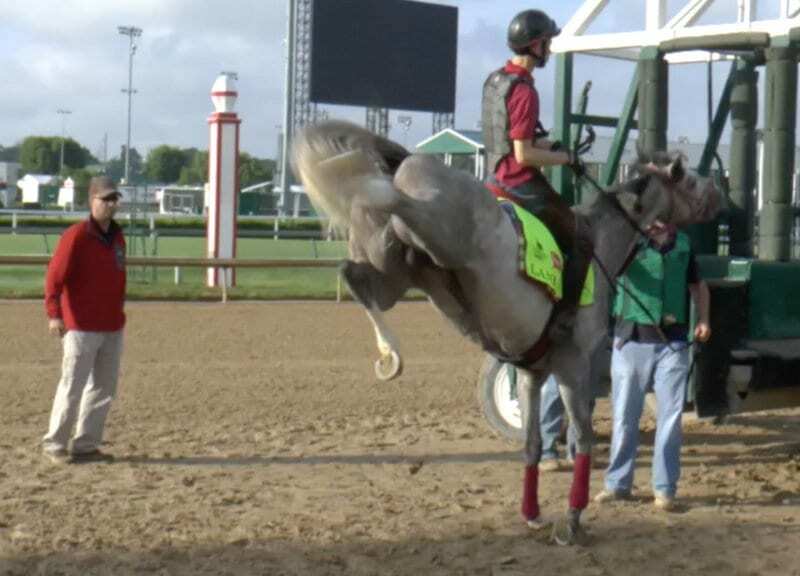 Lani, a striking gray son of Tapit, and his morning antics provided a unique fire during the lead-up to the Kentucky Derby, and even exercise rider Eishu Maruuchi admitted that Lani is the one in charge. Taking several more trips around the Churchill Downs oval than his contemporaries each morning, the colt's “amorous” desires were often proudly displayed before and after each workout. The team, including trainer Mikio Matsunanga, dealt with the same behavior on Derby Day, keeping Lani well behind the other horses on the walk-over and away from them in the paddock. He was even allowed to gallop out past the starting gate before the post parade. Though he broke slowly in the Derby, and was forced very wide on the final turn, Lani managed to make up enough ground to finish ninth, earning a run in the Preakness Stakes this Saturday. He will be shipping in from Belmont Park, where he is stabled in Barclay Tagg's barn. Additional boards were installed to increase Lani's “privacy,” and the team says he has been more relaxed in his morning workouts. This entry was posted in Triple Crown and tagged 2016 kentucky derby, 2016 preakness stakes, Barclay Tagg, churchill downs, eishu maruuchi, keita tanaka, koji maeda, lani, mikio matsunaga, tapit by Paulick Report Staff. Bookmark the permalink.